Srinagar: Prime Minister Narendra Modi visited Srinagar on Sunday to inaugurate several developmental projects in Jammu, Kashmir and Leh regions of the Himalayan state. 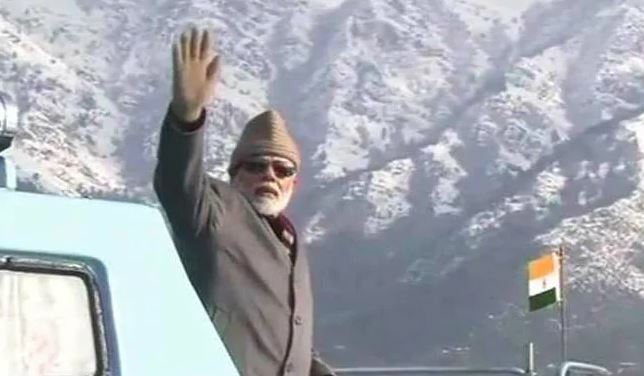 During his visit, PM Modi also visited Srinagar’s historic Dal Lake amid tight security. For his visit, a curfew was imposed in Srinagar, with mobile services temporarily being suspended, and the Internet services being snapped. A video of him, posted by the BJP’s official Twitter handle, showed him waving while in a boat at the Dal Lake. However, what was missing from the video were people. In the short clip,PM Modi is seen waving to someone, but no one there to acknowledge his wave. This prompted a series of trolls on social media who criticised Modi for waving at an absolutely empty Dal Lake. Kashmiris have questioned the video by alleging that with the strict security measures in place, there was no way there were people who were waving back at Modi. Besides, Dal Lake is huge and one cannot see who is at the banks. Similarly, PDP Chief and Ex-Jammu & Kashmir CM Mehbooba Mufti also took a jib at the PM for waving at an empty lake. She tweeted- “For the those who are asking, the wave is for BJPs countless imaginary ‘friends’ in Kashmir”.